In the film that opens John Terry’s production of Aladdin, a camel is wandering the streets of Chipping Norton. The villainous Abanazar asks at the electrical shop for a magic lamp and is directed to the theatre, bursting through the doors to clamber onto the stage. 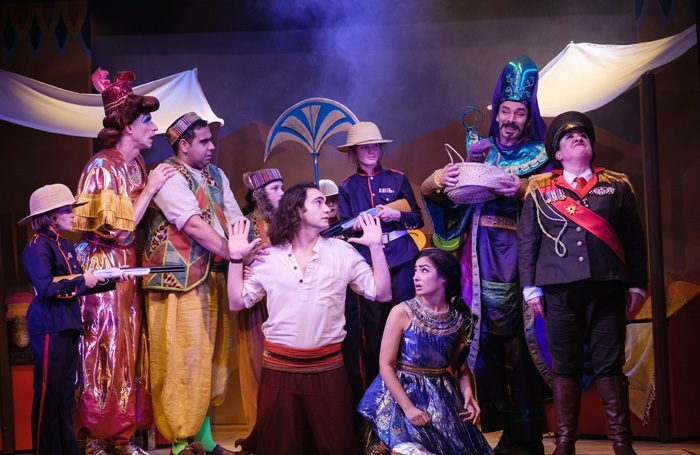 The Theatre Chipping Norton’s 2018 pantomime transports its audience to ancient(ish) Egypt. The location is effectively evoked by Pip Leckenby’s gold painted set, which is dominated by two presiding sphinxes, and Steven Edis’ musical score. Andrew Pepper as Aladdin’s mum Dame Gertie wears costumes to die for, from an orangey gold, quality-street wrapper jumpsuit to an astounding Pyramid dress, complete with sphinx headdress (designed by Emily Stuart). Pepper’s sultry, jazz number ‘No-one seems to want you when your husband’s dead’ is a highlight of the first act. Zelina Rebeiro and David Djemal make convincing romantic leads as Aladdin and Jasmine, with a particularly strong vocal performance from Djemal. Tessa Vale gives a hilarious performance as Jasmine’s imperious mother the Empress. Ben Crocker’s script contains all the beloved panto ingredients: a sing-a-long, plenty of “he’s behind you” moments and physical comedy. John Terry’s directing contains flashes of theatrical innovation that lift the production from the formulaic to the inspired. The performers thrillingly evoke a flying carpet ride, through perching miniature puppets of their characters on giant top hats. The audience is enlisted to hold cardboard clouds. In the intimate space of the Theatre Chipping Norton, the puppetry sequence creates a moment of theatrical magic.